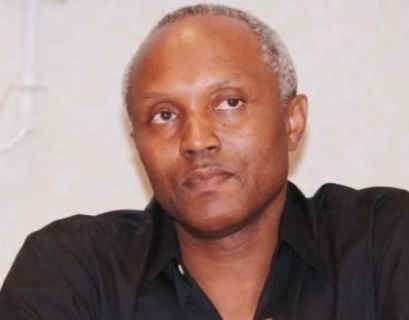 Besieged by the Police By Okey Ndibe. President Goodluck Jonathan is notorious for moving at slower than the speed of a snail when called upon to address issues that rather demand alacrity. Yet, Nigerians are besieged by a terrible plague that Mr. Jonathan can—and should—address immediately. It’s the plague of the “privatized,” lawless police. I was quite familiar with that nightmare scene. During my last visit to Nigeria, I spent time in Lagos, Calabar, Awka, and Enugu—and I saw that ugly scene play out numerous times in each city. I came away with the impression that police officers, whose orientation ought to be the combating of crime, had been deployed to serve as mai-guard (private security guards) for the country’s well-heeled—including those who had accumulated their huge nests in illicit ways. Indeed, one saw two classes of police officers in Nigeria. One class—those on private deployment whose job is to harass the rest of us on behalf of their wealthy “owners”—struck me as clean and well dressed, their boots shiny, a sheen to their skins. The other class—who stood in the sun worrying motorists for bribes of N20 or more per car—appeared scruffy, their uniforms dirty or torn, their boots dusty or spattered with mud when they did not wear flip flops. This misapplication of police power compounds the atmosphere of lawlessness in a country where might frequently usurps the place of what’s right. Each police officer in Nigeria is paid from the collective resources of all Nigerians. It is bad enough that the Nigerian police are scandal-prone, that they hardly know the first thing about solving serious crimes, that their training equips them to view Nigerians, not with any sense of civil regard, but as legitimate sport for all manner of violent impulses. To now “privatize” police officers, especially the dreaded ones called mopol (for mobile police), to lend these police officers to do the bidding of private citizens who happen to have mortgaged their senses for a haul of cash—to do this is to worsen Nigeria’s state of anarchy. Mr. Jonathan ought to order the police to immediately stop the practice of deploying police officers on private duties. There’s a precedent for such a directive. Former President Olusegun Obasanjo, who was no great custodian of law and order, saw fit to instruct the police to pull officers who were seconded to non-government officials. President Jonathan should tread the same path. Nigerians’ most benign epithet for the police remains “Wetin you carry?” It grew out of the lazy question that police officers pose to hapless motorists they stop at ubiquitous police road blocks all over the country. These road blocks are ostensible crime-fighting devices, but any Nigerian kindergartner knows that they are, in reality, bribe-collection points. In fact, Nigerians know that their police are allergic to fighting crime. Quite often, the police seem enamored of criminals. There are accounts of criminals who menaced their innocent victims with guns supplied by the police. Many Nigerians would say that, frequently, they can’t tell the police apart from criminals: both are so deeply, so inextricably embedded. Nigerians know or tell some version of a joke that’s the product of despairing experiences. The kernel of the joke goes like this. A horde of armed robbers descends on a neighborhood, shooting sporadically into the air whilst going from apartment to apartment to haul away cash and valuables. A distressed victim makes a frantic telephone call to a nearby police station, breathlessly describes the harrowing event, and asks that police officers be sent to combat the robbers. In some countries, the point is made that the police are the citizens’ best friends. Suggest that to Nigerians, and you’d provoke guffaws. The Nigerian police are nobody’s friends. Some Nigerians would say their police are friends only of criminals. The Nigerian police offer little or no help to law abiding citizens. Some Nigerians would contend that ruthless criminals receive plenty of help from the police. There’s—to cite one example—the case of Lotachukwu (Lota) Ezeudu, a 19-year-old accountancy student at the University of Nigeria who has never been seen since he was kidnapped on September 26, 2009. The main suspects in his abduction include Sam Chukwu, a divisional police officer (DPO), and Desmond Chinwuba, a sacked police officer who was standing trial in an earlier armed robbery. Both men have been on the run for several years. Some believe that Mr. Chukwu was the mastermind, that he ran a criminal ring whose nefarious menu included assassinations, armed robbery, and kidnapping. Among those in custody are Ernest Okeke, fired alongside Mr. Chinwuba, and Nnaemeka Chukwu, the DPO’s son. Rogue officers like the fugitive Sam Chukwu further taint the already unflattering image of Nigeria’s police. They are one reason some took to calling the country’s law enforcement agency the Nigerian Police Farce. Nigeria’s police are trapped in a crisis that demands long-term remedies, addressing in a fundamental way how police officers are trained, equipped and paid. For now, however, President Jonathan has a duty to spare Nigerians from some of the excesses of the police. He should order that no police officer should be seen working “private” shifts for Nigeria’s deep pockets. Chief of Staff: Jonathan considers Rtd General •South-South battles South-West. THE ongoing reorganisation in the Federal Government may see a retired General being appointed as the Chief of Staff to the president, it was learnt on Friday. This came as certain forces around the president are also said to be advising President Goodluck Jonathan to scrap the office. They are said to be suggesting that the president’s Principal Secretary combine his duties with those of the Chief of Staff. The position of these ‘advisers’, the source said, was informed by what was described as the perceived excesses of the last holder of that office. A presidency source, however, told Saturday Tribune that two retired senior army officers – a Major-General and a Brigadier-General, both from the South-West – have been contacted to sound them out on their disposition to possible appointment to the position if the president eventually decides to do so. One of the two Generals is from Oyo State while the other hails from Lagos State, Saturday Tribune learnt. The decision to go for a retired General for the post, the source said, is one of the options being considered by the president who is under intense pressure from the South-West and the South-South to ‘give them’ the position. It was gathered that the initial demand for the post by the North was defeated by the argument of the South that the North already had more than its fair share in the Federal Government line-up. The North presently parades the Vice-President, Senate President, Speaker of the House of Representatives, National Security Adviser, the Chief of Defence Staff, among others. The argument of the South-South in demanding for the position, it was gathered, is that the last occupier of the post hailed from the zone and as such, the post should remain there. Apart from the cries of marginalisation in the Federal Government by the South-West, it was learnt that a key figure in the civil society organisations (names withheld) was with the president on Monday where discussions touched on the appointment of the president’s chief of staff and the need to pacify the South-West with the post. The final decision on the appointment, the source said, is that of the president who is said to be weighing options and balancing the scales on the allocation of portfolios to the newly appointed ministers. Fashola Funding APC Registration From State Treasury – Lagos PDP. The Lagos State Chapter of the People’s Democratic Party, PDP, has accused the Governor of Lagos State, Babatunde Fashola, of sponsoring the ongoing All Progressives Congress, APC membership registration from the State Treasury, while at the same time crippling governance in order to participate and monitor the said registration exercise. In a statement signed by the Publicity Secretary of the PDP in Lagos State, Mr. Taofik Gani, the party also berates what it termed mismanagement of funds and maladministration by some of the 57 Council Chairmen whom they alleged have replicated same act in their various Council Areas. “We can now confirm that the ongoing APC membership registration, especially in Lagos State, is enjoying the sponsorship of Governor Fashola. The Governor has also condoned the decision of the 57 Council chairmen to divert their council funds into the clearly party exercise. “They have spent at least 7billion Naira paying for the registration materials, staff, massive promo adverts at all levels, and inducing persons to register. This amount could have been better utilised to improve the lives of Lagosians”, the statement read. Consequently, the Lagos PDP has hinted that it may invite the Economic and Financial Crimes Commission, EFCC, to probe the allegations. “This party, APC, has no membership yet and cannot claim any financial membership as well. Who, then is bankrolling their ongoing membership registration process? Governor Fashola must give us answer to this question. “Lagosians demand to know. We have stronger, direct and circumstantial evidence for the EFCC to proof that the ongoing APC membership registration is being sponsored from the Lagos State treasury”, it concluded. by: Channels Television. Bola Tinubu- Yoruba leaders didn’t invite me to confab meeting. has said he did not attend the Friday meeting of Yoruba leaders on the proposed national conference because he was not invited. A group, Yoruba Committee on National Conference, had met at the Isara-Remo, Ogun State-home of an elder statesman, Sir Olaniwun Ajayi, to strategise on the selection of delegates for the South-West geopolitical zone ahead of the conference. Some of the prominent Yoruba leaders at the meeting were Governor Olusegun Mimiko of Ondo State; Afenifere leader, Chief Reuben Fasoranti; former Minister of Finance, Chief Olu Falae; Gen. Alani Akinrinade (retd. ); activist lawyer, Dr. Tunji Braithwaite; Afenifere leader, Chief Ayo Adebanjo; Bishop Bolanle Gbonigi (retd. ); Archbishop Ayo Ladigbolu; and the convener, Save Nigeria Group, Pastor Tunde Bakare. Speaking to our correspondent on Saturday, Tinubu’s media aide, Mr. Sunday Dare, said there were attempts by some leaders in the South-West to sideline other Yoruba leaders, especially those in the APC. He said, “Have you asked whether they (APC leaders) were intimated about the meeting? There was no communication whatsoever. There was an attempt by a group of self-appointed Yoruba leaders to isolate some other persons. And this has been going on for a long time. “There was no information out there, whether in the public or privately. And it is not possible for these leaders — the APC leaders or the Yoruba leaders in the APC — to go for a meeting they don’t know about; a meeting they were not invited to. It is not possible.” Also, the Publicity Secretary, APC, Lagos State chapter, Mr. Joe Igbokwe, said it was left to the people to judge whether they were the leaders of the Yoruba nation or not. He said such a meeting without Tinubu and the APC governors from Lagos, Oyo, Ogun, Osun, Ekiti and “probably” Edo states was incomplete. Igbokwe said, “There are leaders, there are also leaders. We, as the followers can choose where we want to be. They are leaders in their own class. I can’t deny Chief Ayo Adebanjo; I know him in the days of the locust. I can’t deny others but there are leaders and there are also leaders. “Asiwaju and the governors of the APC states (in the South-West) were not there. If you’re doing something in the South-West and you cannot find the APC leaders who have about 90 per cent control of the leadership of the zone, then what are you talking about? It means that there is a lacuna.” But his Ogun APC counterpart, Mr. Sola Lawal, said the opposition party was still opposed to the conference and would not attend such meetings as a result. He stated the party had made it clear that the conference must be attended by ethnic nationalities only. He said the party’s opposition to the confab had been justified by the announcement that the memorandum from the exercise would be subjected to legislation by the National Assembly and that the recommendations by the Presidential Advisory Committee on National Conference had been widely criticised. Lawal said, “As progressives in the APC, we do not believe in that conference because we have not seen the sincerity of the President Goodluck Jonathan-led administration to put the conference together.” Contrary to the claim that he (Tinubu) was not invited, Ayo Adebanjo was quoted in a national daily newspaper on Saturday as saying that Tinubu and other APC chieftains rebuffed efforts made to invite them to the forum. Lagos Magistrate Court Grants Injunction Against Police Land Take Over Of Atiporome Community. A magistrate court judge in Badagry has granted an injunction against a police invasion, and demolition of over a thousand houses at Atiporome community in Badagry. The magistrate, Judge Adesanya (Mrs.) ruled on Wednesday that the police invasion and demolition of the houses was in contempt of court, as a suit was pending regarding the ownership and tussle on the land. Magistrate Adesanya in her ruling also lambasted the police over its arbitrary demolition of more than 1,500 houses in the Atiporome community. She wrote the action by the police left residents there homeless. Just a few weeks before their removal, Atiporome community residents had stormed the offices of the Lagos State Government in Ikeja. They aired their complaints and demanded government intervention on their behalf. But not much came with the airing of their plight before government officials. The Lagos State Government was also busy, ironically, at the time, wrestling with residents of the Okun-Idasho community, in Ibeju-Lekki, in a strikingly similar legal battle, to take over their land for its Lagos Free Trade Zone project. In recent weeks before the new injunction, police had demolished well over a thousand houses in the community, claiming ownership to the land. The magistrate ordered the police authority to be immediately served with the court order to avoid further excesses, as she ruled on the application for injunction. This latest legal step was filed collectively by members of the Atiporome community. The matter was adjourned set for a March 20th hearing. What Hope For Inclusive-Education In Lagos? By Augustina Armstrong-Ogbonna. To all intent and purposes, Lagos state still ranks top when it comes to innovations and promotion of education. One of these innovations in the area of education is the running of several inclusive schools across the state. In Lagos state, thirty-two government owned schools run inclusive-education for the deaf, blind, dumb, mentally and physically challenged. The secondary schools operating inclusive-education for the deaf and hearing-impaired are located in Eric-Moore:Surulere, Badagry, Epe, Ikeja and Ikorodu. Since the beginning of the 2013/2014 academic session, students of Ikeja Senior High School lacks teachers for the deaf class. The population of the deaf students, which was about seventy at the beginning of the academic year, has begun to reduce as some of the students in the senior class have withdrawn from the school. Investigation reveals that only ten students are left in the senior high school and two have withdrawn, but they may become extinct by the end of the academic year if sign language teachers or interpreters are not employed to teach the students. One of the teachers at Ikeja High School, who spoke under anonymity said everyday is depressing for the hearing impaired students in the senior class as the teachers who come to teach the students continue to speak to the deaf students. Also a recent visit by one of the officials from the Lagos State Ministry of Education to the school indicated that the state government is not ready to employ teachers for the hearing-impaired students. Ikeja High School is the only government owned school under Ikeja District 6 operating inclusive education for the hearing impaired. 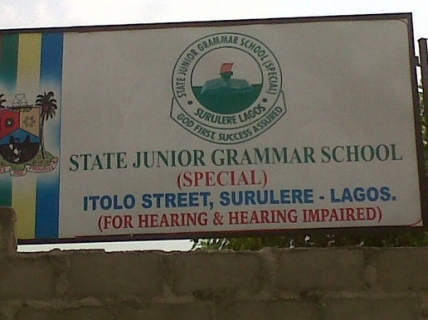 Further investigation reveals that Ikeja High School is been directed to admit students with hearing impairment, but the school has only two sign language teachers for the whole hearing impaired student population. Also at State Grammar Schoool Eric Moore Surulere that has an estimated population of over 400 hearing impaired students for both junior and senior school, teachers are also in short supply. The school has about ten teachers for the deaf students and only one mathematics teacher for the hearing impaired students. One of the volunteer teacher who was part of the Lagos state “Eko Project” Mr. Olajide Adeniyi said if not for the Eko project, education in state would have suffered lots of set back. He explained that most of the teachers recruited for the project function as full time teachers but are paid only #15,000. “As at the moment, most schools have stopped paying the Eko Project teachers and this has resulted to lack of teachers in most schools across the state. Here in State Grammar School, I am no longer an Eko Project teacher but I volunteer to teach mathematics to the junior secondary school students in class 3 to assist them in preparing for the junior WAEC exam. If not for my passion for these children, I would have left but they will be ill prepared for the major examinations”, he added. At Wesley School for the Deaf located in Surulere, one of the teachers who spoke under anonymity lamented that the introduction of inclusive education in 2007 by the Fashola administration was a good concept but it lack monitoring and is gradually becoming a burden. According to him, over ten teachers were recruited from Wesley School for the Deaf to assist other schools that started operating inclusive education but till date none of those teachers were replaced. “The government is not employing teachers for students with special need training. It takes a lot of patience and psychological development to transfer knowledge to hearing impaired students. Most times we rely on students from colleges of education who come for their basic teaching practice experience, if not for them it won’t have been easy for us the teachers to cope with the work load. Though things have changed compared to the past, as students enrollment has increased over the years. We have people enrolling there children from an early age, this is a good for the educational development of the child. Most deaf students don’t like going home after school because their family members don’t know how to communicate in sign language. I will recommend for there to be more schools for the hearing impaired especially boarding school facilities as this help the children to integrate with their fellow classmates and boost their academic performance”, he concluded. Efforts by Our correspondent to get reaction from the Public Relations Officer PRO Mr. Jide of the Lagos State Ministry of Education proved abortive as he described the lack of teachers at Ikeja High School for the hearing impaired as an allegation that needs to be confirmed. Access to universal basic education is one of the seven Millennium Development Goals MDG, which member countries of the United Nations are meant to attain by 2015. But these goals of which provision of universal basic education is one have challenges bedeviling it which may hinder it attainment in many states of the country. It is still unfortunate that many top government officials do not see education beyond formal schooling for the able and privileged children. Whereas so many Al-majiri children are scattered across the Northern part of the country who with little exposure to education will make them better citizens. It is in this regard that planning and catering for these children with special needs as well as the Al-majiris should be part of annual state and federal budgeting.